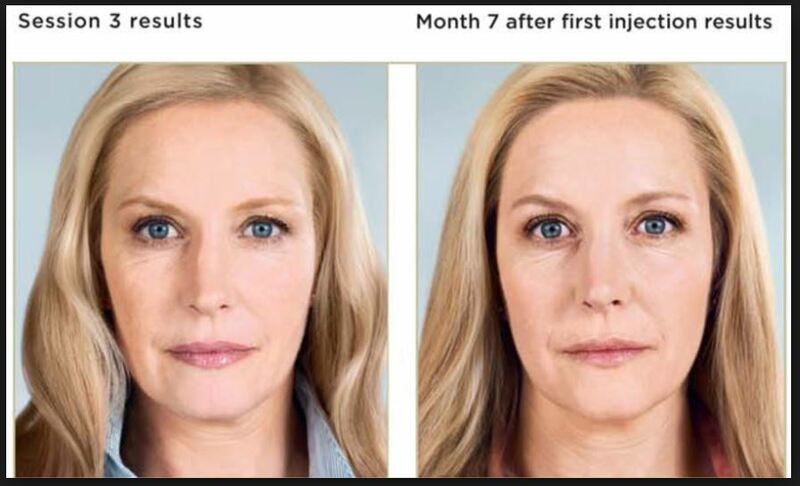 Sculptra (poly-L-lactic acid) is a biodegradable injectable filler that restores and corrects the deep wrinkles and signs of facial fat loss that develop as we age. In 2004, Sculptra was approved for use in the United States. Sculptra is completely different from every other filler available. It slowly and gradually fills in the deep wrinkles over time by building collagen. Sculptra is administered by many small injections into the deep skin layer. These biodegradable particles slowly stimulate your own body’s collagen production to build up the skin. No. Immediately after your treatment with the doctor, it will appear that the Sculptra filled in the area because of swelling from the injections and water used to dilute Sculptra. In one to three days the swelling goes down and you will likely look just as you did before the treatment. Your body will gradually produce its own collagen with this procedure and the results will be subtle and gradual over time. The clinical recommendation is a vial per decade of the age of the patient. However, this can change depending on your need for overall correction or specific area needs, for example (Jaw line only). Results will vary among patients, but treatments typically last for up to 2 years or longer. After your initial consultation with a Renew Clinician, your Sculptra treatment can be typically be scheduled that day. During treatment we will numb the topical anesthetic for your comfort. We ask you eat a meal or sorts prior to your visit. Your trained injector will then inject small amounts of Sculptra with a very fine needle in the areas requiring volume or assistance with collagen growth. Multiple injections are typically given. The area will then be massaged thoroughly to distribute the product evenly. An ice pack can be applied to the treated area to help reduce swelling. What should I do and expect after treatment? Right after your treatment session, you may experience redness, swelling, pain, or bruising in the area. These effects are not typically severe and often resolve in a few hours to a few days. Make-up can be applied a few hours after treatment if no complications are present (such as open wounds or bleeding). For the first 24 hours after treatment, you should apply an ice pack to the area for a few minutes at a time to help reduce swelling. For one week after treatment, you should massage the treated area 3 times a day for 3 to 5 minutes. Avoid excessive sun exposure or tanning beds until any swelling and redness has completely resolved. What are the possible side effects with Sculptra? The most common side effects with Sculptra can occur after any injection, and include bruising, bleeding, swelling, redness, tenderness, or pain. These effects can last, on average, 3 to 17 days. As with any skin injection, there is also a risk of infection.One possible delayed side effect with Sculptra is small bumps under the skin in the treated area. These small bumps are typically not visible or bothersome, and may only be noticed when you press on the treated skin. The skin bumps tend to occur within 6 to 12 months after the first treatment. They may sometimes resolve on their own. Rarely, visible bumps, sometimes with redness, have also been reported. How soon can I go back to my regular daily activities? 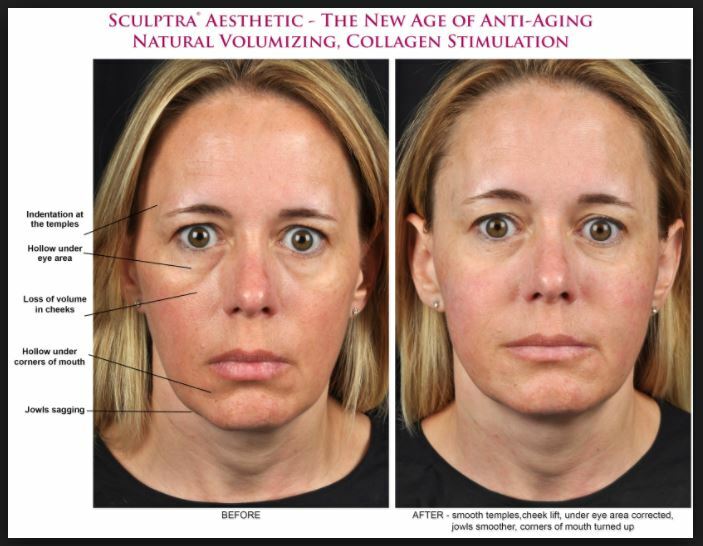 Most patients feel comfortable after a Sculptra treatment and are able to resume normal activities immediately. However, it is not wise to plan an important social function for several days after the procedure, just in case you experience bruising or other side effects. Restylane is known as hyaluronic acid, a natural substance found in the skin that keeps the skin plump and supple. It has the same effects as collagen, but lasts longer. What is the difference between Restylane and Collagen? Restylane is a newer product than collagen, but it has been used in Canada and Europe for many years. It was FDA approved in 2003 for use in the U.S. You typically get similar results with Collagen and Restylane, but Restylane lasts longer. (i.e. Collagen: 3-4 months. Restylane: 6-9 months, depending on the area). It is injected to help smooth certain facial wrinkles. It can improve smile lines from the side of the nose to the side of the lips, plump up the lip or to smooth out the wrinkles around the lip, fill hollows under the eyes and can also plump up thin, floppy earlobes. There is some discomfort with the Restylane injections. To minimize any pain, a strong topical numbing gel is applied for about 40 minutes prior to the procedure. This numbing method works well for most patients. Rarely do patients need numbing injections to prevent pain. Yes, Restylane is a natural component of skin. It is not made from animal or human tissue, so you don’t have to worry about risk of disease. There is a very rare risk of temporary allergic reaction, but the vast majority of people have no complications or problems. You most commonly see swelling, which is significant in the first 24 hours (primarily with lip injections). Some patients may have some bruising in the area. Do not plan any social activities for at least 24 hours after your treatment. If you have a big event coming up, have the Restylane injected at least a week or two prior.